Summary: These posts about the climate change debate not only provide little-known information about this important subject, but illustrate important aspects of US society. Many posts on the FM website have discussed the Right’s anti-intellectualism and emotional reasoning in pursuit of political goals. Today we look at the same dynamics on the Left. The Left’s long years making wild charges of “lies” and “racism” have burnt away their credibility, as we see in the example below. It’s sad, now that they can validly do so against the GOP — buy few beyond their fellow partisans believe them. For example, see Kevin Drum analysis of the same Globe and Mail article discussed in Still good news: global temperatures remain stable, at least for now. The Mail article quoted eminent climate scientists; Drum quotes none. The Mail article says “global warming is real”; Drum says that the Mail says the opposite (“denial”). And most importantly, Drum’s main criticism is wrong — a widely misunderstood aspect of global warming. The Daily Mail, which has something of a specialty in climate denial, apparently discovered this weekend that Britain’s Met Office has updated its long-term global temperature series. This happened several months ago, and the changes from the HadCRUT3 series to the HadCRUT4 series were fairly minor, but I guess anything is a good excuse to rerun one of their oldest wheezes: a colorful chart that starts with the unusual temperature spike of 1997-98 to make it look like global warming has stopped. You know the rest of this story, right? It’s a noisy data series, and if you choose any other starting point — 1996 or 1999 will do fine — the trendline looks quite different. A chart that includes the entire past century is below, and as you can see, it’s easy to find several decade-long plateaus if you cherry pick the data just the right way. But if you look at the entire series, it’s pretty obvious that the world is still heating up. Drum shares a commonplace belief among laymen,that the past two centuries of warming results from anthropogenic CO2 emissions. That makes graphs like Drum’s compelling evidence for anthropogenic global warming — even for catastrophic climate change. In fact the early warming constitutes a recovery from the Little Ice Age. Our CO2 emissions went ballistic after WWII (see data here), and became a major driver of warming sometime after that. That short period of anthropogenic-driven warming is why many scientists (eg, those cited in my post) discuss the statistical significance of the pause (important information of which Drum appears ignorant). This is clear in the climate literature. As we’ll see in the next post: When did anthropogenic CO2 become the major driver of modern warming? When did anthropogenic CO2 become the major driver of modern warming? Next Post When did we start global warming? See the surprising answer (it’s not what you’ve been told). If this were a stock chart, the trendline which started in the mid-1970s has clearly broken sometime in the early part of the 2000s. That doesn’t mean that this isn’t just a pause in a larger uptrend, but there is a possibility that this could lead either to a longer plateau or a reversal in trend. What if the anthropogenic factors turn out to be terraforming which is counteracting a return to a cooler trend as the world experienced with the Little Ice Age? Fortunately we have sophisticated statistical tools to answer such questions. And it’s an active area of research by climate scientists (see the next post for more about this). Also: we cannot “read” graphs well, just confidently. Work by people like Meir Statman (Prof, Santa Clara U) show that people are terrible at interpreting graphs. This debate reminds me of the economics debate. Could the entirety of the established mainstream economists (scientists) be wrong, possibly. Here is where FM’s cautions in the economics debates can be rightly placed in this column as well substituting “scientist” for “economist”. That’s a natural and understandable reaction to these debates are they are reported in the mew media, and by lay partisans (who cheer their side as mindlessly as drunks in a UK soccer game). It’s seldom accurate, and not in the current climate and economics debates. In both cases there are — as usual & proper in science — debates within the mainstream about key questions of research. The articles about climate science on the FM website are posted to show this debate, which the mainstream news media works dilligently to conceal. I think mainstream news media work diligently to attract and hold the eyeballs of their target audience long enough to bundle that audience up and sell it to an advertiser, which, after all, is the business they are in. One of the ways they do that is by telling the target audience something that agrees with what the audience believes, which makes the audience feel good, and stay tuned. You could see a network taking that info and saying, Hmm, I wonder how many of that 40% are also in our target audience, let’s do some alarming global warming stories. Another network, with a different target audience, might use a different story entirely, to go fishing for the 25% of American adults who are “doubtful” or “dismissive” of global warming. Now just substitute scientists for economists with regards to mainstream media and once again here we are. Hat tip to Watts Up with That. … The climate of the past few hundred years is of clear importance because it allows scientists to put today’s warm period into context, and provides some evidence of the influence of the quantity of greenhouse gasses that mankind has injected into the atmosphere. In much literature and during many debates statements to the effect that it is warmer now than it has been for thousands of years are frequently used. As the authors point out the major problem with reconstructing the climate of the past few thousand years is that the so-called instrumental period – for which we have direct measurements – only stretches back as far as the middle of the 19th century. To overcome this researchers in this paper compile an impressive number of temperature proxies situated in the extra-tropical Northern Hemisphere. There are 91 in total, comprising ice-cores, tree-rings (density and width), lake and sea sediments, historical records, speleotherms, and pollen. All of them go back to 1500 AD and 32 go back as far as 1 AD. The reconstruction of past climate has improved significantly in the past few years due to the availability of more proxies and better statistical analysis. The authors acknowledge this and point out the differences that are emerging from the reconstructions conducted about a decade ago. They mention two such reconstructions performed by Michael Mann that they say, perhaps typically for the period, show little variability. They add they display, “little evidence for previous temperature anomalies comparable to those of the 20th century.” The authors conclude that previous climate reconstructions “seriously underestimate” variability and trends in the climate record of the past two millennia. This new analysis shows that the warming we have seen in the late-20th century is not unprecedented, as can be seen in figure 1. Seen in the reconstruction is a well-defined peak of temperature between 950–1050 AD. They also find that the first millennium is warmer than the second. We present two new multi-proxy reconstructions of the extra-tropical Northern Hemisphere (30–90◦ N) mean temperature: a two-millennia long reconstruction reaching back to 1AD and a 500-yr long reconstruction reaching back to 1500AD. The reconstructions are based on compilations of 32 and 91 proxies, respectively, of which only little more than half pass a screening procedure and are included in the actual reconstructions. The proxies are of different types and of different resolutions (annual, annual-to-decadal,and decadal) but all have previously been shown to relate to local or regional temperature. We use a reconstruction method, LOCal (LOC), that recently has been shown to confidently reproduce low-frequency variability. Conﬁdence intervals are obtained by an ensemble pseudo-proxy method that both estimates the variance and the bias of the reconstructions. 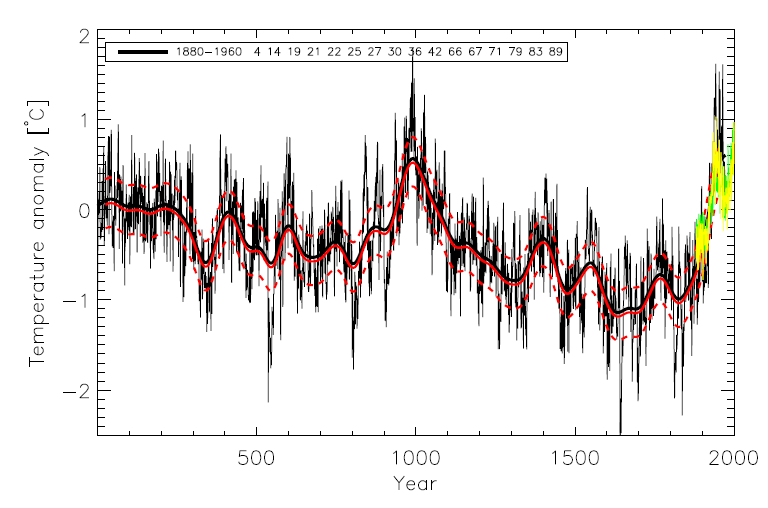 The two-millennia long reconstruction shows a well deﬁned Medieval Warm Period, with a peak warming ca. 950–1050AD reaching 0.6◦ C relative to the reference period 1880–1960AD. The 500-yr long reconstruction confirms previous results obtained with the LOC method applied to a smaller proxy compilation; in particular it shows the Little Ice Age cumulating in 1580–1720AD with a temperature minimum of −1.0◦C below the reference period. The reconstructed local temperatures, the magnitude of which are subject to wide conﬁdence intervals, show a rather geographically homogeneous Little Ice Age, while more geographical inhomogeneities are found for the Medieval Warm Period. Reconstructions based on different subsets of proxies show only small differences, suggesting that LOC reconstructs 50-yr smoothed extra-tropical NH mean temperatures well and that low-frequency noise in the proxies is a relatively small problem. Clearly this was an oil funded study. Klem takes us to the next frontier for comments on the FM website. We’ve always had science, philosphy, and literature. This year people have added music (lyrics, videos). Now klem introduces humor. That’s a valuable contribution, for I’ve no skill at irony or humor. Looks a lot like a long term inflation adjusted gold chart. With both there seems to be an element of faith that we are heading for an upside breakout. Feels more like religion than science. No. There is a large body of evidence and analysis behind the consensus forecast of continued warming. That does not make it correct. Science takes place on the edge of the known, both in terms of available data (see the comment with a new paper about past climate, showing current warming is not unprecedented in historical time) and theory. The aspect of the climate wars I find disturbing is not the science (proceeding in its usual sloppy fitful way), but the increasing anti-intellectualism of lay partisans on both sides. Increasing anti-intellectualism, no wonder. The intellects are telling us that we need to stop burning fossil fuels because that behavior is sinful and the earth god Gaia will exact future climate apocalypse. Where have we heard that kind of talk before? Feels more like religion than science to me too. Like klem, I too have wondered about the widespread use of Christian tropes in modern American politics. By both right and left, in all sorts of contexts. Residual imprinting on our minds from our past? Burning embers from which a revival of religion — not necessarily in traditional forms — might burst forth? It’s beyond my pay grade to analyze, let alone forecast. Can anyone point to articles or books about this? New paper: “Deducing Multi-decadal Anthropogenic Global Warming Trends Using Multiple Regression Analysis“, Jiansong Zhou and Ka-Kit Tung, Journal of the Atmospheric Sciences, in press — Free abstract; article is gated. When the AMO is included, in addition to the other explanatory variables such as ENSO, volcano and solar influences commonly included in the multiple linear regression analysis, the recent 50-year and 32-year anthropogenic warming trends are reduced by a factor of at least two. There is no statistical evidence of a recent slow-down of global warming, nor is there evidence of accelerated warming since the mid-20th century. In order to unmask the anthropogenic global warming trend imbedded in the climate data, multiple linear regression analysis is often employed to filter out short-term fluctuations caused by El Nino-Southern Oscillation (ENSO), volcano aerosols and solar forcing. These fluctuations are unimportant as far as their impact on the deduced multidecadal anthropogenic trends is concerned: ENSO and volcano aerosols have very little multi-decadal trend. Solar variations do have a secular trend, but it is very small and uncertain. What is important, but is left out of all multiple regression analysis of global warming so far, is a long-perioded oscillation called the Atlantic Multi-decadal Oscillation (AMO). When the AMO Index is included as a regressor (i.e. explanatory variable), the deduced multi-decadal anthropogenic global warming trend is so impacted that previously deduced anthropogenic warming rates need to be substantially revised. The deduced net anthropogenic global warming trend has been remarkably steady and statistically significant for the past 100 years. don’t tell al gore or brad delong this is their religion,and source of income. Why people believe — or profess to believe — is a mystery. And estimating their degree of sincerity is doubly so. But, as Michel says, always fascinating! I don’t know about Gore, who I’ve read has profited mightly from being green. But I’ve read DeLong for decades, and can at least guess about his beliefs. Climate change is not likely a substantial source of income from him (he’s a Berkeley Professor of Economics). As for his religion, I doubt that environmentalism stirs strong emotions in him. Weak faith-based impulses. But most Americans, and ESP those on the left, are in my experience pale figures in a spiritual sense. Challenges to his faith, infidelity so his spouse, murder of his child — things that would provoke violence in many people of other times and places, produce shrugs (perhaps tears) in bourgeois 21st century men. It’s a common historical phenomenon, and creates the potential for revival. Perhaps a religious one, like those that have swept America so often before. Or a political one, like those in 1920s Europe. I interpret the carbon emissions differently. There is a case to be made that carbon emissions have been on a parabolic curve of xponential growth since 1850. Follow the curve from 1850 to abut 1912 (midway between 1880 and 1945. then continue it at the same upward climb. The continued curve meets the existing curve a bit before 1977 (mid point between 1945 and 2010. 1945 simply reversed a slowing of the trend going back to 1850 by the looks of the graph. 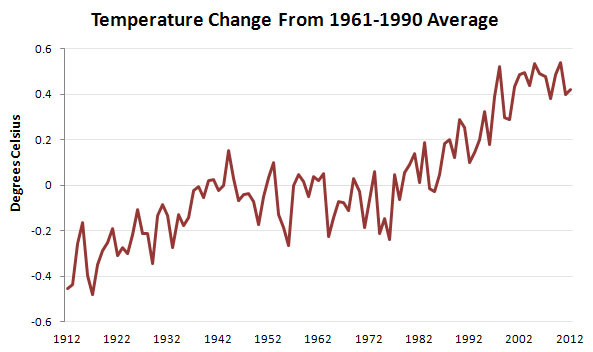 The Mother Jones graph oddly chooses to compare temperatures to the average between 1961 and 1990. Why those years? Then the graph displays temps 22 years after this range and 50 years before it. Again, why? I like Mother Jones but this reeks of cherry picked data. I’m a fan of taking a cautious approach to global warming. Where we can cut carbon emissions we should and odd presentation of data doesn’t help offset the economic-gains-even-at-the-cost-of-human-extinction crowd. It places doubt even in the minds of allies like me. (1) We cannot “read” graphs well, by looking at them — just confidently. Work by people like Meir Statman (Prof, Santa Clara U) show that people are terrible at interpreting graphs. Fortunately we have sophisticated statistical tools. (2) As for CO2, see the next post When did we start global warming? See the surprising answer (it’s not what you’ve been told). It has information and expert opinions on some of the issues you raise. Including a graph of CO2 emissions.